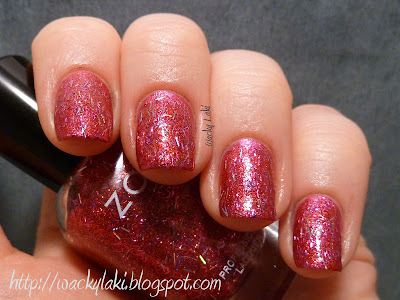 Another complex glitter from Zoya. 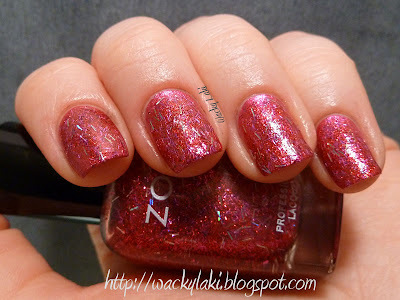 This one is made up of small red and pink glitter as well as purple and holographic bar glitter. This one contains the most holographic bar glitter out of the three glitter shades in this collection. A very unique polish indeed! This is two coats of Kissy (plus a top coat) over two coats of Izzy from above. I decided to stamp this one with another lacy pattern. I think it is really pretty how the glitter peaks through all the holes. It gives the manicure some depth. For this stamping I used Bundle Monster plate BM-209 and Wet 'n Wild Black Creme. 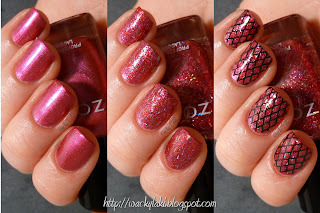 Let me know what you think of the polishes or stamping! I like the detailed information (color number etc.) you give about each polish; that's helpful. 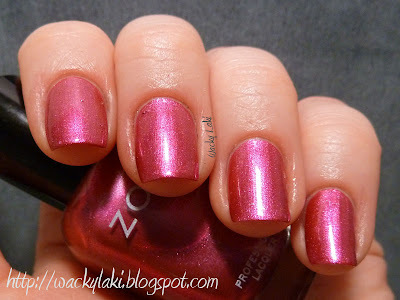 I'd like to be on the Zoya name-choosing committee too; they have so many polishes, and they haven't used my name (Gena) yet! I want my namesake polish to be a purple duochrome/flakie glitterbomb! I looove your black stamping over it all. Very pretty. Bar glitter is really growing on me now! Yayy!! I love Izzy. I just added it to my stash. I have yet to wear it though :-/. Looks great on you! this is so pretty! i love glitter and pink so this is awesome! So pretty! 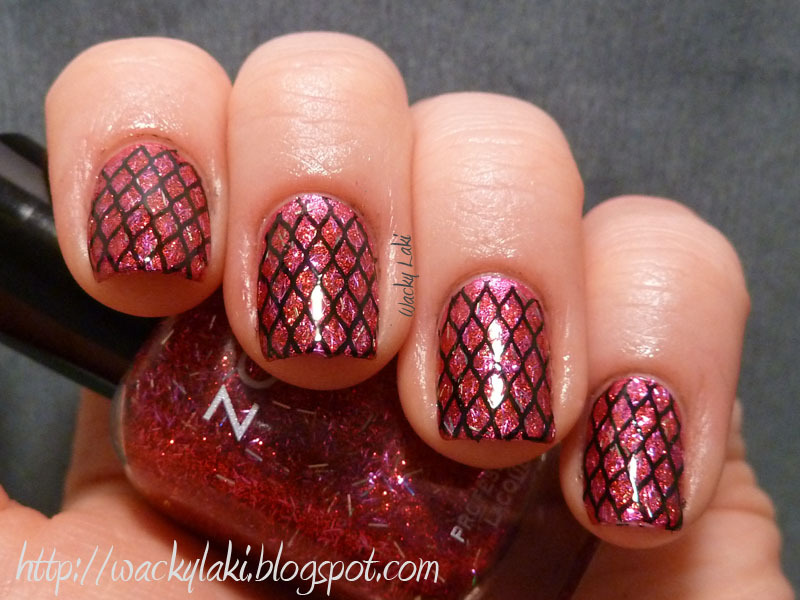 Loving the stamping! 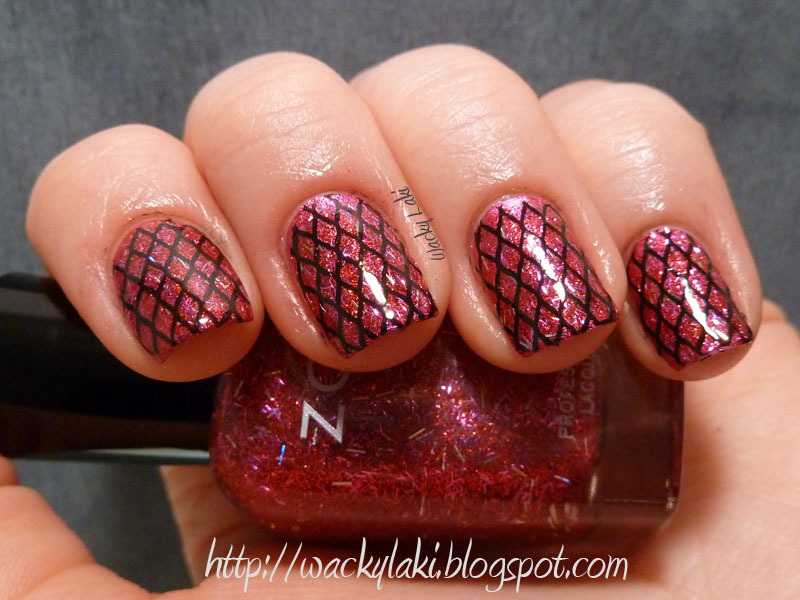 Your stamping is always so awesome!! !